We can take anything from air conditioners and washing machines to televisions and computers. If you have an old hot tub sitting around that never gets used, free up that space by having it removed. Have an old shed that looks to be falling over? Call us and we will come to your home and tear it down. If you have junk piling up and you feel helpless or don’t know how to handle it, give us a call today! Need to get rid of unwanted junk, trash, yard debris, or more? 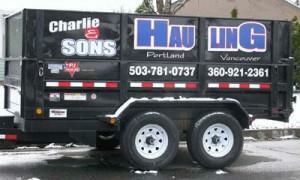 Charlie & Sons is a professional hauling service company specializing in junk removal in Portland, . We haul away ALL unwanted items from Residential, Business, Commercial, and Rental Properties. We do the hauling, loading, and clean-up, for LESS with exceptional customer service. And We Recycle! We serve Residential and Commercial customers in the Portland Metropolitan and Vancouver areas. We have several 1-Ton Pick-Up Trucks with Dump Beds that hold 6 cubic yards and a Dump Trailer that holds 12 cubic yards. It is one of the largest in the junk hauling in Portland industry allowing us to service jobs of ALL sizes. Working hard for you 7 days a week, rain or shine. No job is too big or too small! Our fast, friendly, reliable service has built a solid reputation and customer satisfaction! Family owned and operated serving Portland, OR, Vancouver, WA, and its surrounding areas since 1994. We also do: Shed and Garage Tear Downs, Clean-Out Rental Home and Apartment Properties, Garages, Attics, Basements, and more! At Job completion we sweep the area clean, and make sure all items were removed to your satisfaction. We do the loading and clean-up for LESS MONEY with exceptional customer service! Our goal is to offer you the best possible service at the best possible price. We offer full junk removal in Portland services, from initial clean out to cleanup and disposal, for a fraction of the competition’s price. We believe in supporting the local community in any way we can and we hope you do to. We are not a national franchise or even a large corporation of any type, this helps us to keep prices low and helps us provide personal service that the larger companies just can’t do. We have been in business since 1994, and have been growing ever since. We know the best places to recycle, and we pride ourselves on our excellent customer service. Charlie & Sons can handle any of your junk hauling in Portland and junk cleanup projects and you can safely trust that the job will be fully completed to your satisfaction. We built our company on a solid reputation for being dependable and our unmatched customer satisfaction. We also pride ourselves on offering fast, reliable services that contain no hidden costs. We believe firmly in doing what we say we will do and would love to prove it to you, please give us a call to start your next junk hauling in Portland project today!